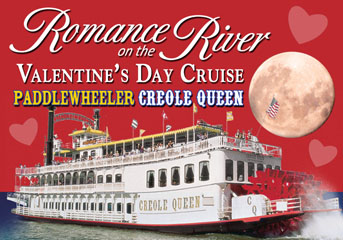 Spend a romantic evening with your special someone aboard the Paddlewheeler Creole Queen this Valentine's Day in New Orleans. Enjoy an upscale buffet menu, open bar, live entertainment, reserved seating for the evening, and complimentary Champagne upon boarding. This luxurious cruise under the moonlight is a fun and unique way to treat your Valentine. Reservations are required and please dress to impress!